If anyone ever cried that there isn’t enough Cenozoic themed extreme progressive metal, well, Endolith step up to the challenge and deliver more than anyone could’ve ever asked for. Chicxulub is a bona fide showpiece waiting to be discovered. Endolith are a powerful three-piece from Tromsø, Norway. 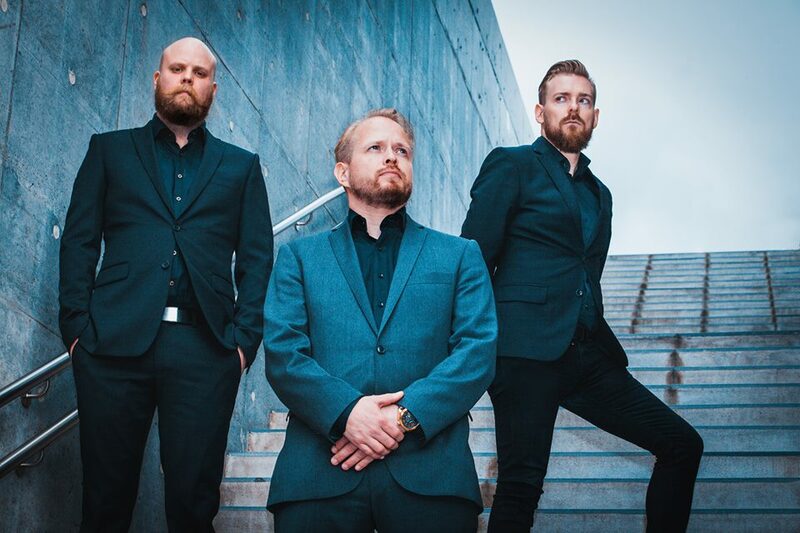 They are composed of Frode Hofsøy (vocals), Erling Malm (guitars, manager, PR), and Roger Tunheim Jakobsen (drums, booking agent). They’ve been active as a band for nearly a decade now. Chicxulub – The Fossil Record is their second full-length and third overall release. Endolith are unfortunately one of those overlooked, criminally underrated bands. Almost three years after their latest album, they bring to the world a mesmerizing journey, which appears to be a scientific-themed extreme prog metal bonanza. First, I would note that an endolith is an organism (usually something like a bacteria) that lives inside rock, coral, animal shells, or in the pores between mineral grains of a rock. Many are extremophiles, living in places long imagined inhospitable to life. The Chicxulub crater is an impact crater buried underneath the Yucatán Peninsula in Mexico. It was formed by a large asteroid or comet about 11 to 81 kilometres (6.8 to 50.3 miles) in diameter. The date of the impact coincides precisely with the Cretaceous–Paleogene boundary (K–Pg boundary), slightly less than 66 million years ago. Also, the impactor (or asteroid) is estimated to have delivered upon impact the energy of 21–921 billion A-bombs. If this concept isn’t metal, I don’t know what is. I would also like to note that the album art is more than fitting. The album intro “Grazing Herbivores” really complements the conceptual setting that has been established. The album is extremely thoughtfully put together, featuring ambitious arrangements that draw influences from a great variety of places. There are a fair amount of heavy, down-tuned grooves scattered about which remind of Gojira – an always welcomed influence. This kind of groove stands out best on “Ichthys” and on the ending sequence of “Rex”. The layering in certain moments, topped with the expansive keyboard playing and quasi-orchestral ambiance send the listener inadvertently to Devin Townsend‘s hallmark wall-of-sound style of delivery. The title track “Chicxulub” (and the last track as well) seems to borrow a great deal from the specific crushing, dense, and massive style that has been championed by The Ocean. This is more than appropriate considering how the concept of the album wouldn’t be out of place on one of The Ocean‘s albums, even in the slightest. There’s also just a dash of violin near the middle of the track that feels like a little Ne Obliviscaris tease. The bedrock of the album draws a fair amount from old school death metal as well, but just a fair amount from modern extreme progressive metal in equal measure. “Bloodfiends” definitely showcases the OSDM influence the most compared to the rest of the tracks. “Mount Evidence” also comes as a close second for this particular influence. “Nest Scrape Display” and Diseasons” emphasize the more modern components of this progressive blend that is going on, distinguishing themselves through their more vivid dynamic and sonic range. There are also some Emperor influences scattered here and there. This is noticeable bit by bit in nearly every song, but also quite prominent on “Kpg Impactor” and even on the title track. “Kpg Impactor” also aptly delivers the sonic equivalent of its reference and features some electronic elements as well. Endolith do great justice to the extreme prog niche with Chicxulub. Across the record, we are treated with a veritable smorgasbord of influences. With this in mind, it is amazing how well fleshed out the band’s musical identity is. Just as amazing is how they give all these influences a unique twist in the context of each song. Even more amazing is the production value and the performance present, especially considering they are a three-piece. Chicxulub is extremely consistent and engaging, giving the listener a truly unforgettable trip.